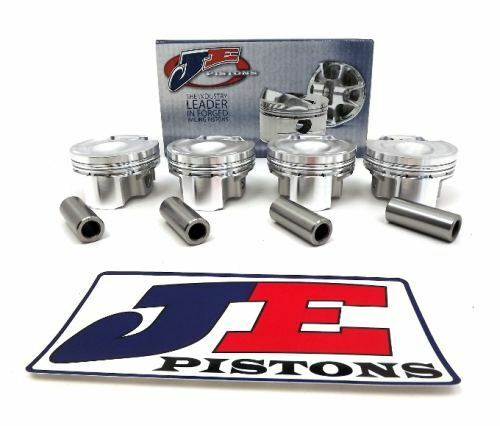 For decades, JE Pistons has manufactured custom postons for thousands of applications. The Ultra Crown machining process allows incredibly precise dome to cylinder head tolerances. By mapping the exact shape of a piston or cylinder head, optimum compression and quench characteristics can be achieved. The Under Crown machining process allows for uniform deck thickness, therefore creating a lighter and more durable piston. This process mills slots into the top of the top ring groove and provides a pathway for combustion pressure to get behind the top ring. This process helps to increase ring seal and is most commin in circle track applications. Ultra Groove is a special ring groove machining process that provides near perfect groove flatness and surface finish. Tolerances are held to millionths of an inch. In certain applications window milling will remove a significant amount of weight from the skirt of the piston while maintaining its strength and integrity. Spin boss refers to machining on the bottom of the pin boss, which removes weight where it is not needed for strength. Machining process that removes additional material for added weight savings. The purpose of machining these grooves is to reduce the amount of contact area against the cylinder wall when the piston "rocks over". Contact reduction also serves to disrupt the flame travel into the crevice area thus helping to reduce detonation. An accumulator groove is machined into the land between the top and second ring. It provides additional volume where residual combustion gases that have "blown by" the top ring can collect. This additional volume helps to reduce pressure between the top & second rung, thus aiding in top ring seal and minimizing ring flutter. Double Pin Oilers deliver twice the amount of oil to the wrist pin as compared to the standard single pin oiler. The pin bore is precision honed to attain an exact pin clearance. Clearances typically range from .0003 to .0010 between the wrist pin and pin bore. Notching can be done on pistons for motors with oil squirters, or to avoid contact between pistons and/or pistons and crankshaft. This process machines one or two holes into the bottom of the pin boss to assist in splash pin lubrication. Most commonly used on Hemi and motorcycle engines, this process leaves a raised area on plunged valve pockets to achieve maximum compression. The Pumaspeed Workshop team are ready to fit the Focus RS Mk3 JE Forged Pistons in our Head Office located here. Pumaspeed have a specialist distribution team that can dispatch the Focus RS Mk3 JE Forged Pistons to any destination worldwide.